The following is a recap of one of the 11 city tours that made up ULI Toronto’s Symposium 2018. On November 7th, hundreds of urban professionals from the region and beyond came together to explore the leading edges of North America’s fastest growing metropolis, exposing the contemporary tensions and innovative approaches to building a global city region. During ULI Toronto’s 2018 Symposium, the “Putting the Public back into Public Spaces” tour explored how Toronto is getting creative in reinventing its public spaces, attracting worldwide attention and serving as inspiration to other cities across the globe. The tour explored some of the city’s most dynamic communities where residents are empowered to take the reins in shaping their parks and public spaces with events, programs, art, and infrastructure that that reflect their unique needs and identities. When this happens, parks and public spaces become more inclusive, interesting, and accessible to people of all ages and abilities. The tour began at R.V. Burgess Park in the central east area of Toronto, in one of the most densely populated and multicultural neighbourhoods in the city. A majority of residents are recent newcomers. 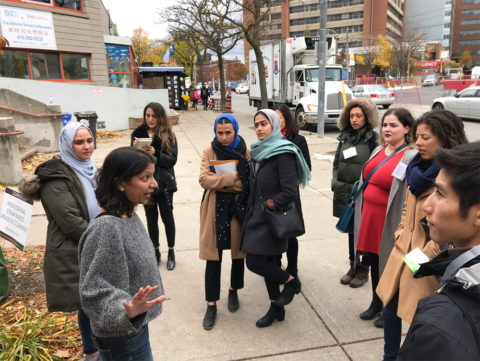 Sabina Ali, the chair of the Thorncliffe Park Women’s Committee (formed in 2008 by a group of women in the community), has led the creative revitalization of R.V. Burgess Park into an urban green space that has brought people together through endless hours of community volunteerism, leadership and partnerships. Years ago, the Women’s Committee noticed the inadequacy of the park (for example, lack of grass, missing playground equipment, broken lighting and water fountains) and recognized the need to bring the mostly newcomer community together. The committee took matters into their own hands to help transform the neglected R.V. Burgess Park into a vibrant community meeting place with a weekly summer bazaar, the first tandoor oven in a park in Canada, and plenty of fun activities for children. It also played a major role in spearheading micro-entrepreneurship in the area while also providing a low-cost food market for the neighbourhood. At Scadding Court Community Centre in the west downtown area of Toronto, Alina Chatterjee, the director of development at the community centre, spoke about the centre’s innovative programs that create opportunities and inclusion for residents while financially supporting the centre’s activities. An example of one of their innovative ways of reanimating their space is Market 707, Toronto’s most unique street food and retail market. 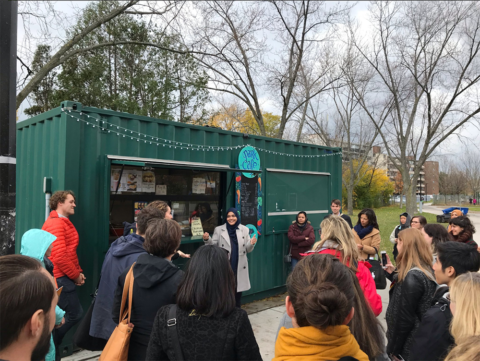 Housed in retrofitted and colourful shipping containers on a sidewalk in front of the centre, the space brings together local entrepreneurs serving up more than 10 types of delicious international street food and unique goods and services. It provides affordable retail/food space for emerging entrepreneurs, particularly newcomers and low-income residents. “If they wanted to start their own businesses, we wanted to create something that would allow them to be able to afford retail space, learn the skills they need to do, but also generate two revenue streams,” she said. Chatterjee spoke of the importance of generating revenue for Scadding Court to ensure the sustainability of the project. “When they make money, we make money so that we don’t ever have to cut programs” said Chatterjee, adding that this will allow the people involved to enter the economic life of the city. At the third stop, Dufferin Grove Park, community activist Jutta Mason spoke about the revitalization of the large park that she helped spearhead. It’s recognized as one of the most community-animated parks in the city. There is also a strong sense of community due to the unusually high number of fun amenities and programs that allow for social interaction among neighbours. Different areas within the park allow people to enjoy the space in different ways. In the food area, there is the opportunity for gardening and baking. There are unique amenities such as communal tables for shared meals and a community outdoor wooden pizza oven. The active area offers basketball courts, volleyball, and a skating rink. Local residents can host community campfires in the fire pits and seating areas. At David Crombie Park in the St. Lawrence neighbourhood, Isorine Marc, the executive and artistic director of Jamii, a not-for-profit organization formed to bring vitality to the Esplanade, spoke about how the community made the park their own and how they are helping guide its future. “It’s the way we do things — revitalizing the public space, transforming it with public art while sharing stories of our neighbours. [We’re] putting the spotlight on who we are, while inviting all the people into our home and sharing with them, in a very generous way, our stories,” Marc said. 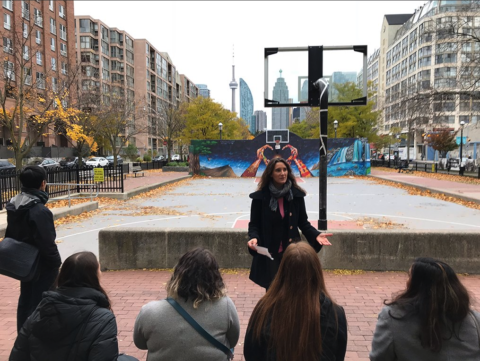 She shared an example of leading a mural painting on the David Crombie Park basketball court wall after Maple Leaf Sports and Entertainment paid to resurface the court, which had been destroyed during a police chase in 2013. Under the guidance of artists, youth were invited to come up with a design for the eye-catching and colourful mural to not only brighten the neighbourhood, but to foster community engagement. Other examples include the many artist-led programs and events (such as outdoor photo exhibits, life performances, outdoor movie nights, murals, etc.) that engage and unite the community. Thank you to 8 80 Cities for organizing this tour.